After falling slightly, the market regained its extreme momentum on Friday. S&P 500 was up 0.64%, Nasdaq was up 0.91%, and Russell 2000 was up 0.92%. VIX was down 6.57% to 13.51 making it an even better time to buy protection from this unsustainable rally. The S&P 500 is now up 11.4% year to date. CNN fear and greed index increased to 69 which signals greed. S&P 500 is now 4.71% off its record high. It is up 18.78% from Christmas Eve. Russell 2000 is up 25.51% in that period. As you can see from the chart below, as of February 20th, the S&P 500, investment grade bonds, high yield bonds were all high. Also, Brent crude oil, and gold all had a 14 day RSI of above 70. 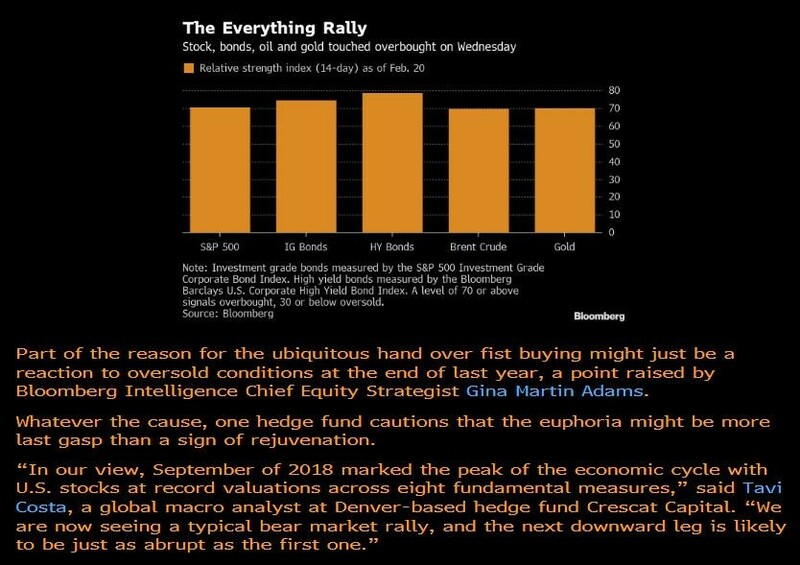 Meaning, they are all overbought. This has truly been an everything rally. Worst sectors on Friday were consumer staples and the financials which fell 0.28% and 0.23%. Kraft Heinz was subpoenaed by the SEC and missed earnings estimates. Its stock fell 27.46% which brought the consumer staples sector down. Best 2 sectors were technology and communication services which increased by 1.29% and 1.05%. Even though the market has increased rapidly, only the utilities and real estate closed at their all-time highs today. Weak Business Investment - Momentum Could Be Good? The stock market has extreme momentum. It has pushed 92.5% of S&P 500 stocks above their 50 day moving average. As you can see from the table below, when more than 90% of stocks are above their 50 day moving average it’s generally a good sign. The median 1-month return is 3% with gains occurring 76.9% of the time. 3-month returns are 4.6% with positive returns occurring 92.3% of the time. That would put the market near its record high. It seems to be universally excepted that when stocks run up too fast they need to pull back.